PORTER - a full bodied ale, that became popular in the Central London with the transportation workers named Porters in the 1700s. It was said, they would mix several styles of beers; an old Ale, that had been soured, a new Ale, brown, or Pale, with a weak Mild Ale. The combination of blending of beers gave a pleasing taste of not a fresh beer, not a stale beer. Modern Porters are typically just a single brew instead of a blend. STOUTS - this top fermenting, almost black brew is made with highly roasted malts. Sweet stout, an English style, generally contains milk sugars, resulting in a sweet and creamy brew. Dry Stout, an Irish style, contains roasted unmalted barley and a small amount of hops, giving its coffee like roasted, slightly bitter dry brew. Imperial Stout, originally for the Russian Czarist, made to last the long journey, just like IPAs, increased the alcohol, and increased the gravity, lending a rich complex dark copper to black colored brew. The main ingredients are dark roasted barley, and black malts, full flavored and intense, just like an espresso. ABBEY ALES - Dubbels, Trippels, Quads are from the Trappist Abbeys of Belgium. This distinctive beer is made traditionally from only seven breweries that can have Trappist on their label; Westmalle, Westvleteren, Chimay, Rochefort, Orval, Le Trappe and Achel strictly overseen by brothers in these respected monasteries. With only 20 brews actually made from the bottle conditioned Ales. These popular beers have lead brewers to copy the styles with Abbey-Style Ales, in these distinct types: Dubbels, Tripels, and Quads. 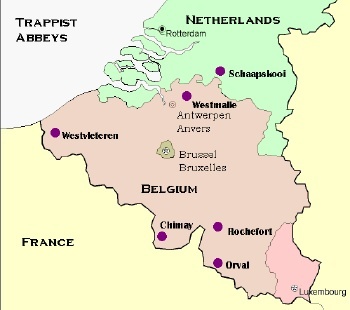 Orval being one of the oldest brewing monasteries, founded in 11 century by Benedictine monks. The Notre Dame d'Orval produces the driest of the Trappist Ales. They began brewing in prior to the French Revolution. Chimay is the most commercial of the Trappist brewers, with 3 beers available in variety of sizes, including magnum bottles of Grand Reserve. Chimay Red, known for its coppery color, light fruity aroma, with a slight bitter finish. Chimay Triple, a typical golden color, with slight cloudiness, smell of hops, and raisins, with no acidity. Chimay Blue, also named Grande Reserve, because of its character of a strong beer, with fresh yeast, light flowery, and a pleasant hint of roasted malt. Westmalle founded in 1794, known formally as Our Lady of the Sacred Heart, and producing beer commercially in 1920. Westmalle Tripel is clear and gold, which goes under second fermentation in the bottle. It has a creamy mouthfeel, slightly bitter, with a fruity aroma. It is called the Mother of all Tripels, first brewed in 1934. The Westmalle Dubbel is dark reddish beer which also goes through secondary fermentation in the bottle. Aromas of special malt, with rich complex herb, fruity, and fresh bitter finish. Westvleteren is the smallest of the breweries, and the most expensive to drink, because you will have to go there to drink it, they do not ship. Westvleteren has 3 different Ales; Blond is made from 3 kinds of hops from the region; Dark 8% has a sweet fruity aroma; Dark 10, 8% is the softest of Westvleteren, also named Flemish Burgundy, for its creamy and carmelized malted taste. Rochefort began brewing in 1595 with 3 dark Ales, formally known as Notre Dame de Saint Remy, southern part of Belgium. "6" or Red Cap is reddish brown color, soft body, with earthy and herbal, dark flavored Ale. "8" or Green Cap has a brown colored, complex, fresh fruit, spice, leather and fig flavors. "10" or Blue Cap has a dark brown color, with a firm malt backbone, with aroma of port wine, leather, oak, spice. Achel is the newest of the of the monastery breweries. Known as the Lady of Saint Benedict. Tripel uses three times the amount of malt, hence the name. They make great sipping beers, due to their high alcohol, typically yellow to gold, yeast, fruity, and a sweet finish. The sweetness comes from the pale malts, and the higher alcohol. Dubbel is a rich malty beer with spicy, mild alcoholic characteristics. Some dark fruit aromas, with a mild hop bitterness, and a steely caramel flavor in this medium to full bodied beer. Quadrupel is a Belgian style of bold strength, and a bolder flavor, compared to a Tripel, or Dubbel. This dark beer ranges from deep red, brown, to Garnet, showing sweet flavors, low bitterness, and distinct alcohol finish. Known as Witbier or White Beers are a very pale and cloudy beer with a high level of wheat, sometimes Oats, that is used in the mash. Always has spices added, like coriander, orange peel, and herbs. The wheat adds a crispness, and a slight twang, and high level of carbonation. Hefeweizen is fermented with special yeast strain that gives a distinctive banana and clove flavor. American Wheat beers are fermented with normal Ale yeast to add a mild citrusy flavor.